When we first published this article (1995), internet had only been in existence for 2 years, and was just starting to make its presence felt at Mexican universities [the UNAM (National Autonomous University of Mexico) was the first to have its own network node]. In spite of this, newspaper and magazine sales had already been dropping for years. Our “newsstands” are more and more appealing ─including María Elena’s, the newspaper seller we interviewed for this article, and whose son still assists customers today (2013)─. 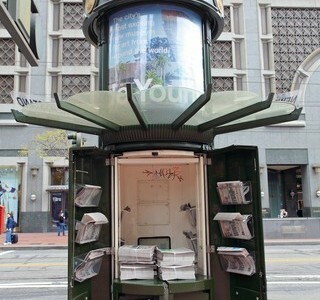 But a nice looking newsstand cannot protect its owners from products that are less and less appealing to consumers. And that isn’t the only problem: Men comprise an increasing number of newsstand customers, and there are fewer of them all the time, because ─as she says─ the general public has drifted away from these retailers… Logically, this has affected sales, since obviously a specific part of the public, will always be less numerous than the majority ─families, those with general interests…─.